I can’t believe it’s the third week of August, and this is my first post. This is also the first August in 12 years that I have not been immersed in Destination Imagination doings, updating the state Web site, putting together a training outline, and assembling marketing materials. I wasn’t sure how I’d feel about this change in routine, but to tell the truth, I am enjoying not being so overloaded. What have I been doing? A lot of reading, but also lots of bookmaking, and yesterday I finally transferred files from an old, outdated laptop to a USB drive so that I could send it to laptop recycling heaven. That cleared up desk space in my sewing room, which I believe I will turn into project work space. So, though you haven’t seen me here, I’ve been delving into projects that had been put off every year at this time because of volunteer work. And to be fair, I am still somewhat involved with the state organization, as there are still many files to be transferred, and I am still doing some behind-the-scenes writing. Today, however, was one of those relaxing days when I didn’t feel much like starting, continuing or finishing any projects. And it was definitely too hot or humid to go outdoors (unless you’re a lizard). I confess I have a strong preference for cold weather over hot weather! Instead, I browsed some Etsy “aisles” and found some lovely handmade items I’d like to share with you. Feel free to click on the image below, which will take you directly to the treasury I curated, and will enable you to visit individual shops where these items are available. I’d love it if any one of these products were gifted to me! © 2014 Judy Nolan. All rights reserved. Every spring, we find ourselves going through closets to weed out unworn, worn-out and poorly-fitting clothes. From year to year, I can’t understand how we keep coming up with bags of items to donate, but I’m afraid this is a ritual that is here to stay. In the process, we also find dusty, neglected corners that need to be cleaned. I’m thankful for any tool or organizer that makes my job easier. Along that vein, here are some fun and/or clever gadgets and organizers on Etsy that will help you clean, organize, and stay organized. The images below are clickable. © Judy Nolan. All rights reserved. It’s a beautiful Easter afternoon, a day to stroll through the neighborhood—whether you have visitors or not. 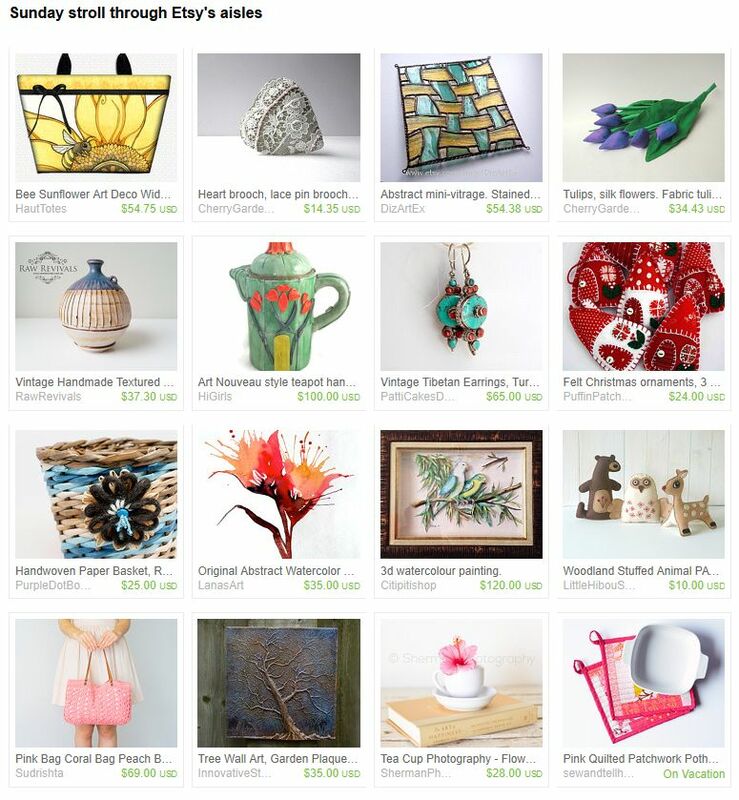 I did the virtual equivalent of a stroll this afternoon by visiting BBEST and Blogging Business Artisans team member shops on Etsy, selecting handmade creations that said “spring” to me. I am so thankful that lawns are greening up and that the day lilies are starting to poke up here and there. Tulips and daffodils can’t be far behind. Happy Easter to everyone who celebrates this holy day, and Happy Sunday to everyone else!